FilmReviews.net/Movies At Dusk/Greg King features another in-depth, very interesting interview with Craig Monahan (35 minutes long!). There’s a brief Don Hany interview at In My Community. And scene-stealer Mark Leonard Winter (and the film’s rats) finally get a profile of their own courtesy Moviehole. Strangerland is also being shopped around at Cannes, but as of 17 May no deals have been announced. And speaking of international distribution, why is Well Go USA dragging its heels on Mystery Road’s US distribution? They secured the rights a long time ago, but thusfar all they’ve done is book a handful of more festival screenings. Better news for UK audiences, as Mystery Road’s Facebook page announced a possible June release there. 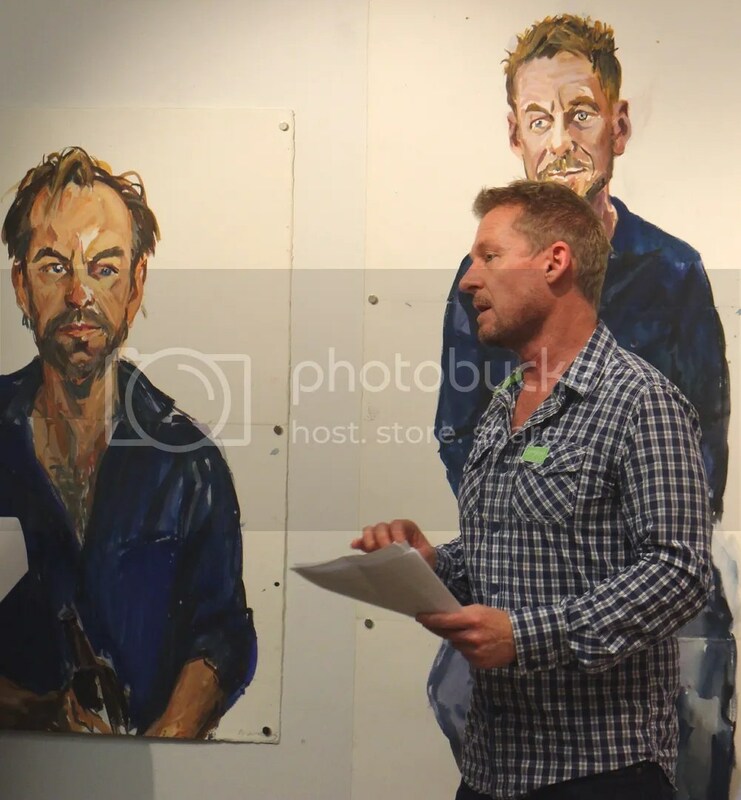 A couple of lovely surprises to share today: the first is a brand new nine-minute radio interview Hugo Weaving gave 720 ABC Perth. 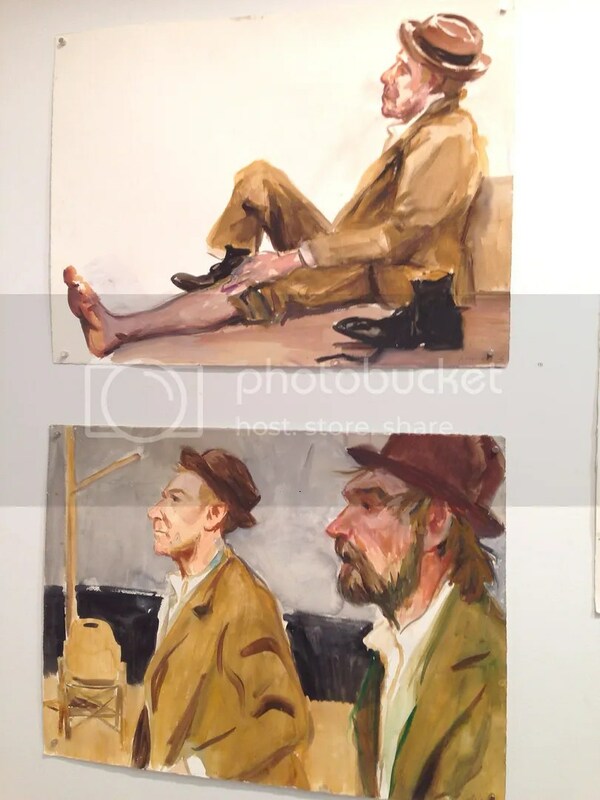 The second is a batch of photos our always-resourceful Sydney correspondent Yvette took at the opening of Nicholas Harding’s Drawing Godot exhibit in Sydney. 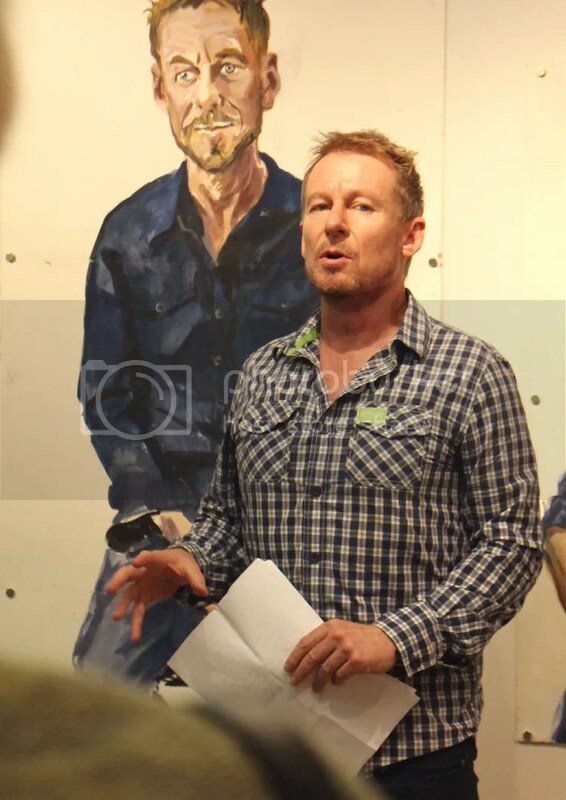 Though both Harding and Weaving were unable to attend (and are possibly vacationing together with their families) Richard Roxburgh more than filled the void with insights, and witty anecdotes about Sydney Theatre Co’s production. After some of the frustrations we’ve experienced with questionably edited interviews, or radio stations who opted not to re-air or offer podcast versions, it’s wonderful ABC has made this available via Soundcloud, which can be readily embedded at both LJ and WordPress. 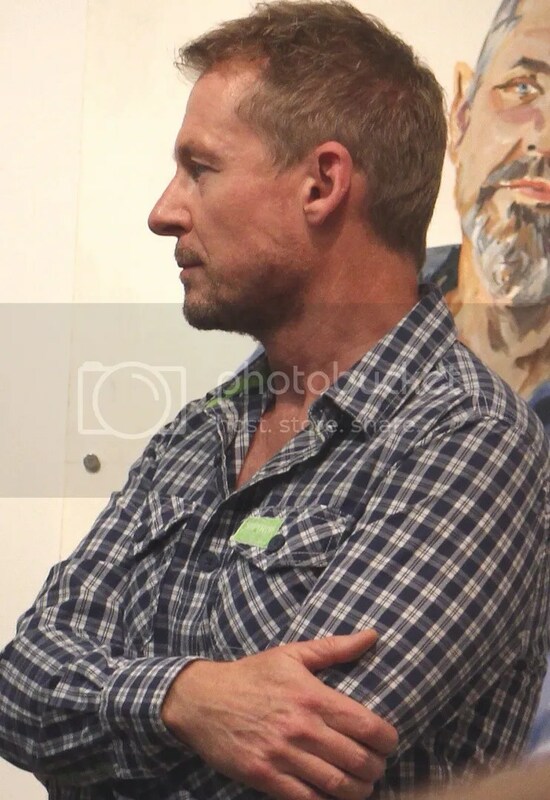 HushHushBiz posted a selection of photos of Hany at the film’s 8 May Palace Cinemas (Adelaide) screening/Q&A. And you can read the latest positive and/or thoughtfully-written reviews at A-List Reviews (“…a fine piece of Australian cinema”) and HushHushBiz (“…strong performances across the board and stunning cinematography”). Healing continues to elicit mostly-positive reviews from both critics and audiences, but I’m saddened to read those audiences haven’t been as robust as they should be, according to Inside Film. I’m completely used to American viewers rushing out in droves to sophomoric Seth Rogen comedies and paint-by-numbers superhero flicks, but it’s depressing that audiences worldwide seem to want the same drivel. I really hope more people will give Healing a chance as positive word of mouth spreads. 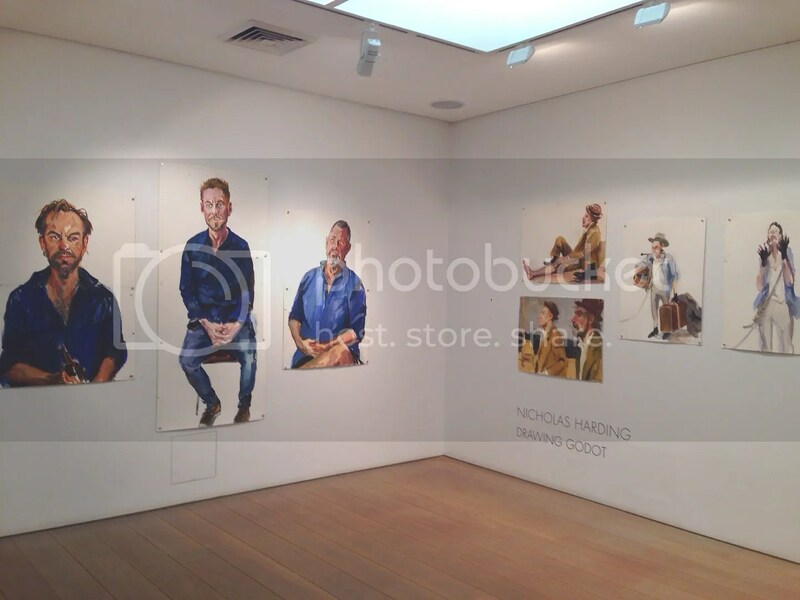 WordPress readers: to see full-sized versions of the photos, right-click, then click “open in a new tab/window”. 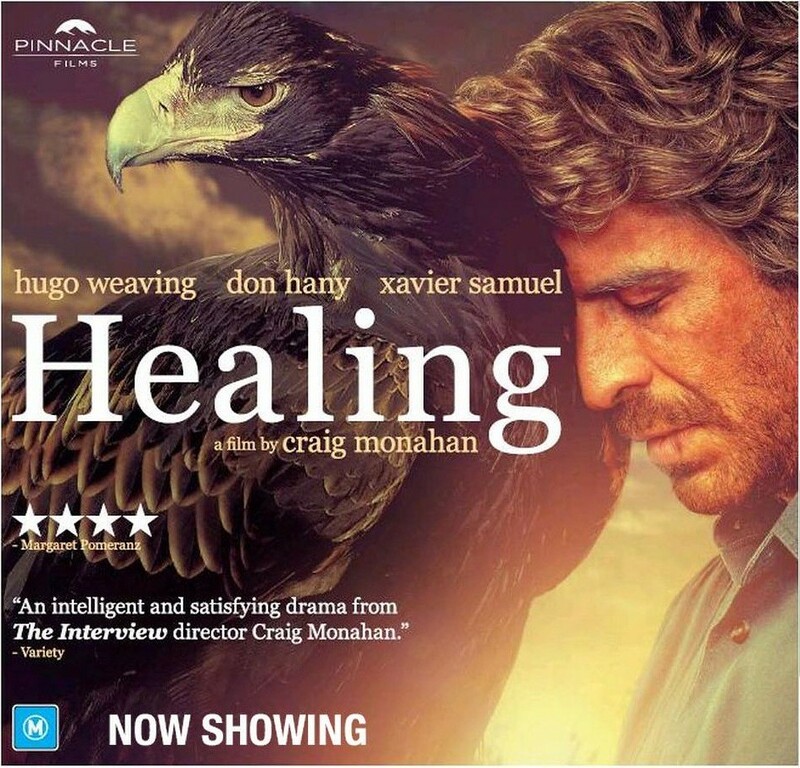 Healing has now opened across Australia to a largely positive response, and new previews/promo materials continue to appear along with reviews. At times it’s been hard to keep up with everything, but for the most part it’s been quite exhilarating. I hope the film finds an audience at home and is picked up for substantial distribution worldwide. I keep hoping that each of Hugo’s exquisitely-wrought performances in indie films will be the one that finally ends the “genre villain” stereotyping of his career by the mass audience; Cate Blanchett, Geoffrey Rush and Ian McKellen have played their share of villain roles, but most people are aware of their character-driven work on stage and screen. Hugo hasn’t been as lucky, though plenty of determined fans do eventually seek out his lesser-known films. But it shouldn’t be such a challenge. Mystery Road, Little Fish, Oranges and Sunshine and particularly Last Ride rewarded cinema viewings, but precious few fans had that opportunity. (I only saw one in a traditional cinema release– Little Fish– and had to drive to New York City to do so. 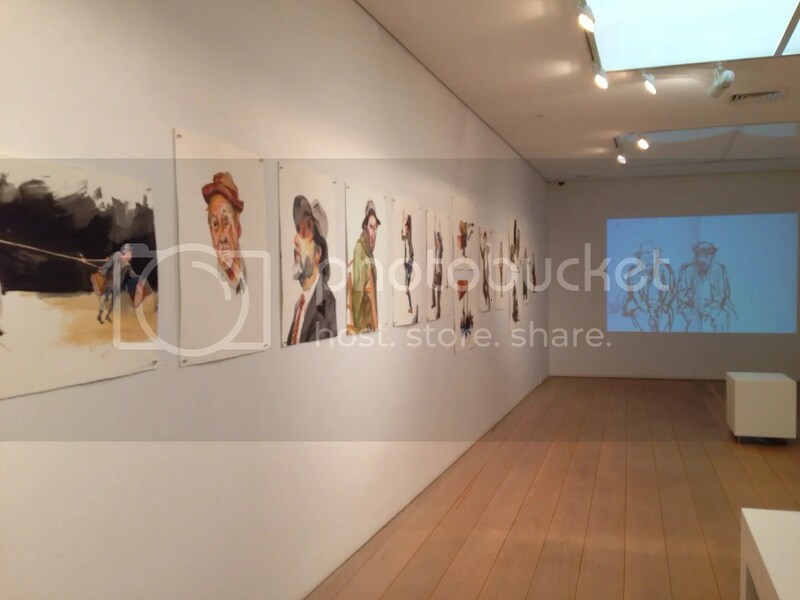 Two others I saw at film festivals and the other in a “special screening” at New York’s Museum of Modern Art. While there’s an infectious, “treasure hunt” aspect to finding these opportunities, too many fans are excluded. Proof and Priscilla got reasonably wide arthouse releases in their day, but these days distributors seem pathetically risk-averse. Even films that were huge hits in Australia (The Sapphires, Animal Kingdom, Red Dog) got minor arthouse exposure in a few US cities. ANYHOW… sorry to go on like that, but I’m hoping– perhaps naively– that Healing will have better luck. If I have to read one more tweet to the effect that “Hugo Weaving only plays villains” I may have to kill somebody myself. I know some fans only want more of the same from their favorite actors, but a substantial majority wants to be surprised now and then. 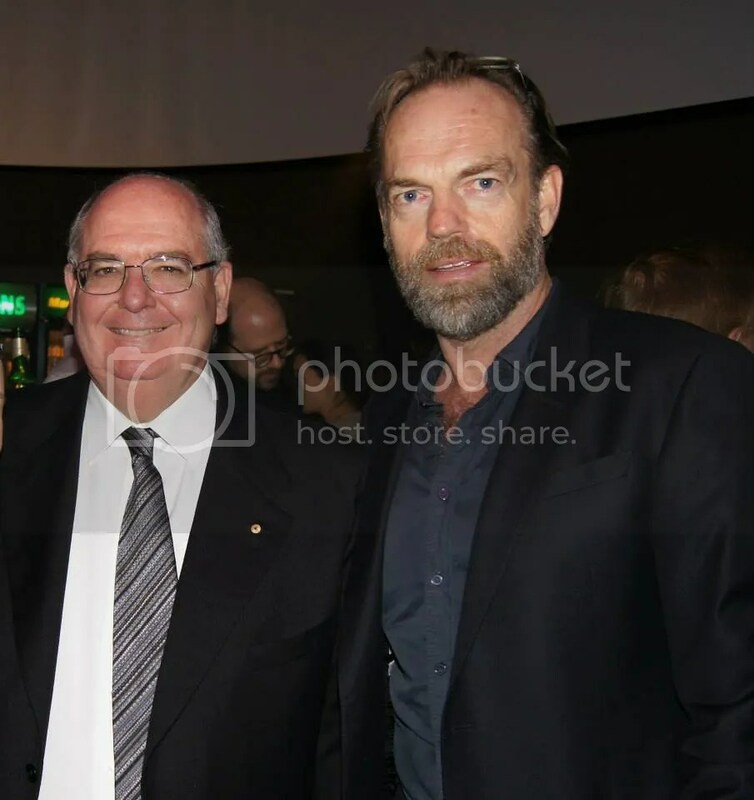 Hugo Weaving is front and center in Pinnacle Films‘ latest lovely promotional clip. He discusses his character Matt and how he researched the film’s real-life program and setting. Monahan also gave a lengthy audio interview, which can be streamed or downloaded, to Radio Adelaide. 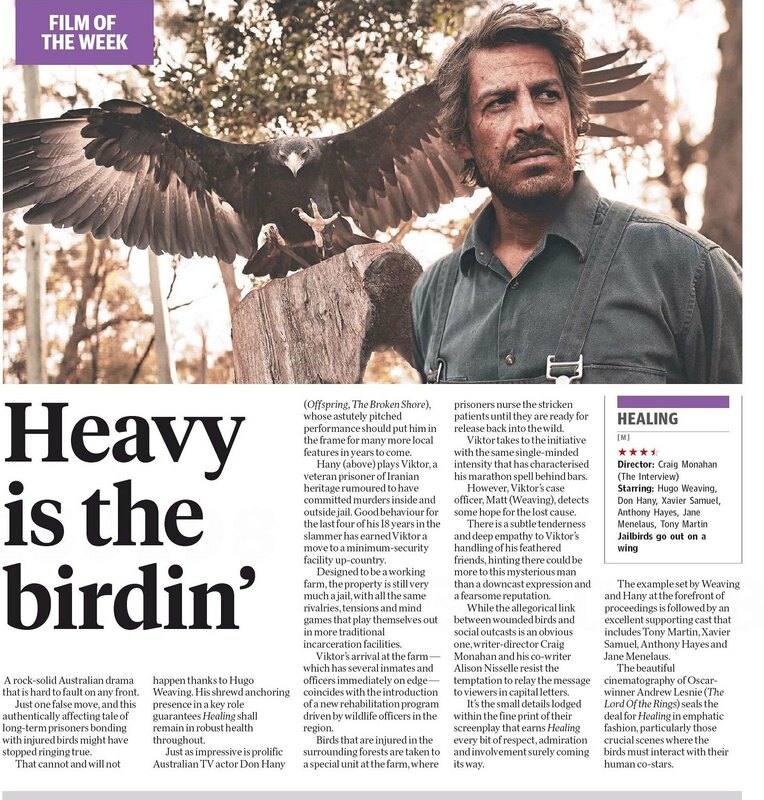 Hany and bird-wrangler Andrew Payne discuss the challenges of working with their avian costars in The Sydney Morning Herald. 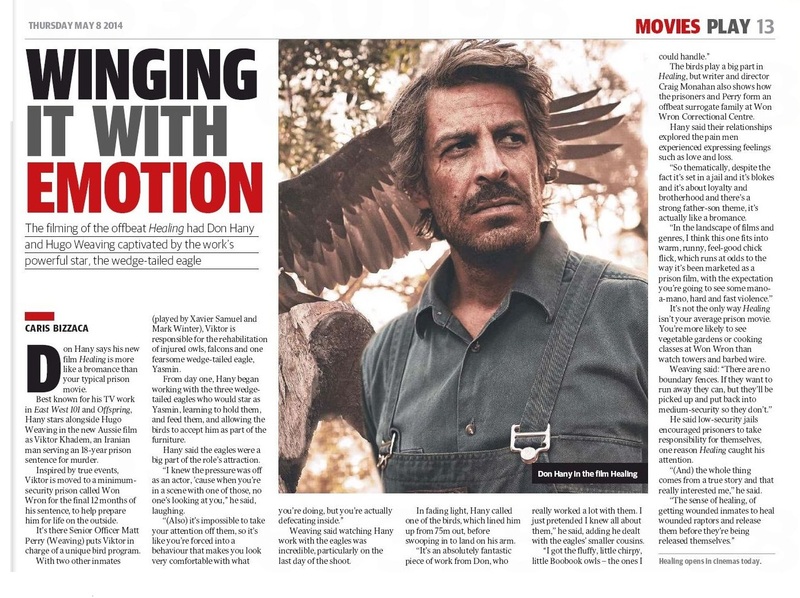 Journalist Sandy George also interviewed Don Hany for SBS, covering not only the film, but his heritage, career beginnings and new opportunities. Matthew Toomey, The Film Pie: “At its heart, Healing is a story of forgiveness and rehabilitation. Viktor saves an injured falcon that became stuck in a barbed wire fence. With the approval of his correctional officer (Weaving) and a nearby animal sanctuary, he helps build an aviary that will house injured birds. They can then be nursed back to full health and released into the wild…. Above all, it is the outstanding cinematography which lifts this redemption story of damaged creatures. Oscar winning cinematographer Andrew Lesnie, who shot The Lord of the Rings trilogy opens Healing with striking images of an eagle sweeping through trees, smartly intercut with inmates in a prison van heading to the correction facility. Throughout, the bird photography would do credit to David Attenborough…. Sharon Hurst, Cinephilia: “There is much to commend this film, Monahan’s third feature since The Interview in 1998 and Peaches in 2004. Perhaps most striking is the cinematography by Oscar-winner, Andrew Lesnie. 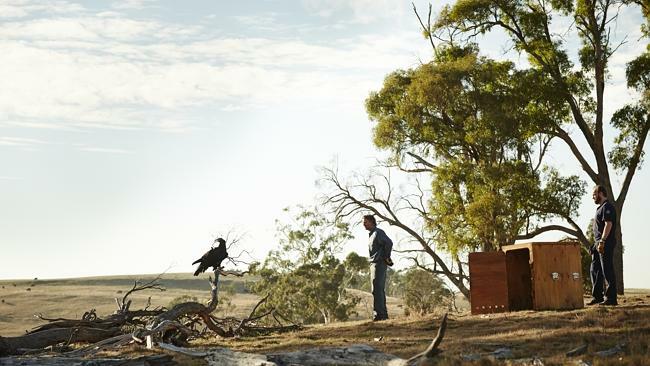 Shot partly in the glorious Yarra Valley, the film’s look encompasses not only the mistily ethereal landscape of that place, but focuses intensely on the majesty of the birds, especially the eagle as it soars and plummets across the sky. Team this with David Hirschfelder’s haunting score and you get an impression of something that almost feels spiritual, so appropriate to this redemptive story. .. In this story of redemption that takes the term jailbird quite literally, a familiar path is trodden, but the delights are in the details. The stereotypical subplot of tension – that sees the prison’s resident bully (Anthony Hayes, Secrets & Lies) enforce his might over Viktor’s helpers, including the sullen Paul (Xavier Samuel, Adoration) and nervous Shane (Mark Leonard Winter, The Boy Castaways) – both conforms to convention and provides texture for the film’s main drama. The trouble caused by interpersonal angst is a menacing but modest challenge to overcome. .. Apologies for letting a backlog of these pile up, but it’s been a busy week. Most of these are print articles previewing or reviewing Healing; the first contains material not (yet) available online. 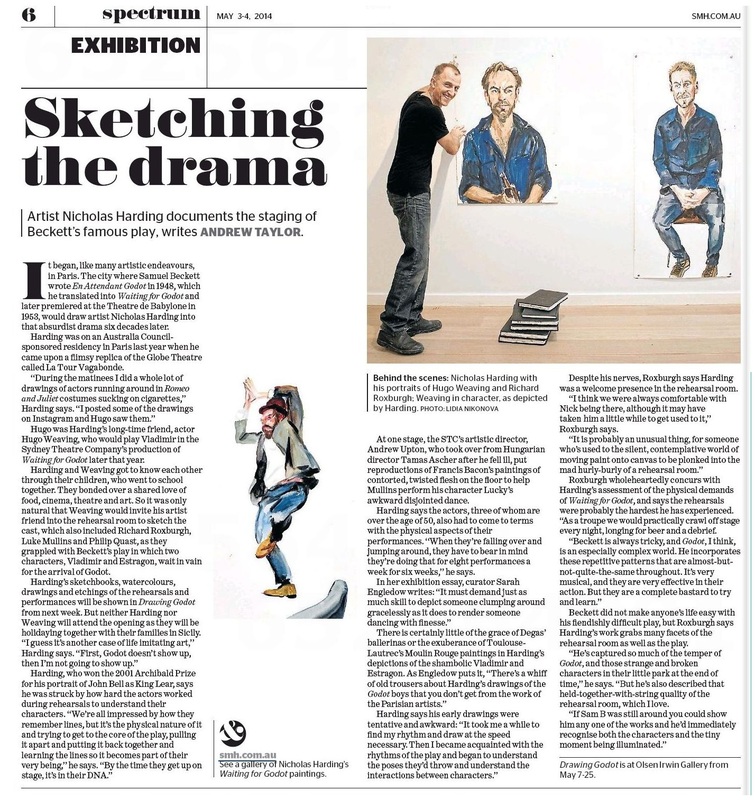 The last is the print version of Sydney Morning Herald’s coverage of the Nicholas Harding Drawing Godot exhibit. Note to WordPress Readers: to see full-sized versions, right-click, then click “open in a new tab/window”. Guardian writer Luke Buckmaster describes his responses in an interesting re-viewing of the 1994 classic The Adventures of Priscilla, Queen of the Desert. And, according to the Twitter feed of Sun-Herald writer Neala Johnson, Hugo’s next film The Mule, which made a big… I’m reluctant to say ‘splash’ 😉 at SXSW in March, has been “pencilled in for an October release in Oz “. The Mule’s Twitter feed retweeted the item, giving it credibility. When last heard from, the film’s creators were busy working on the trailer, so we might have a look at that soon. Hugo Weaving has been playing extreme, audience-dividing characters ever since he first caught our attention in the famed Kennedy-Miller television mini-series Bodyline (1984), in which he impersonated the reviled MCC captain Douglas Jardine. Whether these characters are sympathetic, such as the shrieking drag artist Mitzi del Bra in The Adventures of Priscilla, Queen of the Desert or Elrond Half-elven in the Lord of the Rings and Hobbit trilogies, or the flat-out villains – Agent Smith in The Matrix series, Red Skull in Captain America: First Avenger – they’re generally a world away from an ordinary man.In recent times, however, we’ve been seeing Weaving playing characters closer to blokes you might meet in everyday life, the polar opposite to the crackpot collection he incarnated in the ill-fated adaptation of David Mitchell’s Cloud Atlas. In Oranges and Sunshine he was deeply moving as the psychologically scarred English migrant who endured being taken from his mother and forced to toil for Catholic Church institutions in Australia; he was wonderfully inscrutable as a country cop in Mystery Road; and he communicated a world of hurt as Vic Lang’s reclusive, troubled father in the David Wenham-directed episode of Tim Winton’s The Turning. “I enjoy playing these colourful, over-the-top characters but they are definitely not me,” Weaving says over the phone from Sydney, where he continues to live despite his flourishing international career. His move from the margins to the middle, character-wise, continues with Healing, a modest yet quietly effective Australian drama set on a prison farm that prepares prisoners for going back into society. Weaving plays Matt Perry, a stern but sympathetic senior officer who puts a tightly wound Iranian inmate named Viktor Khadem (Don Hany) in charge of a program to rehabilitate injured eagles, falcons and owls. Viktor is coming to the end of a long sentence for murder and doesn’t want to mix with the other prisoners. 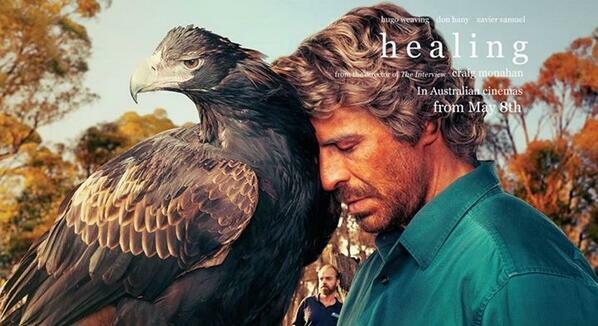 Matt feels that putting him in charge of the program – in particular, caring for a majestic wedge-tailed eagle with a 2m wing span named Yasmine – will draw Viktor out and, in turn, his strong work ethic will be a good influence on the younger prisoners, who are being preyed upon by opportunistic old hands. Healing is the third time that Weaving has worked with co-writer and director Craig Monahan, who made a sensational feature film debut in 1998 with The Interview and followed up in 2004 with Peaches. Apart from the desire to work again with Monahan, with whom he has forged a very productive director-actor relationship, Weaving says he was drawn to Healing because it showed a positive side of the prison system. The role is arguably the closest Weaving has come to a regular guy in the classic Hollywood mould, a steely, quietly spoken figure who has his own problems at home but heroically stands up for Hany’s Viktor. 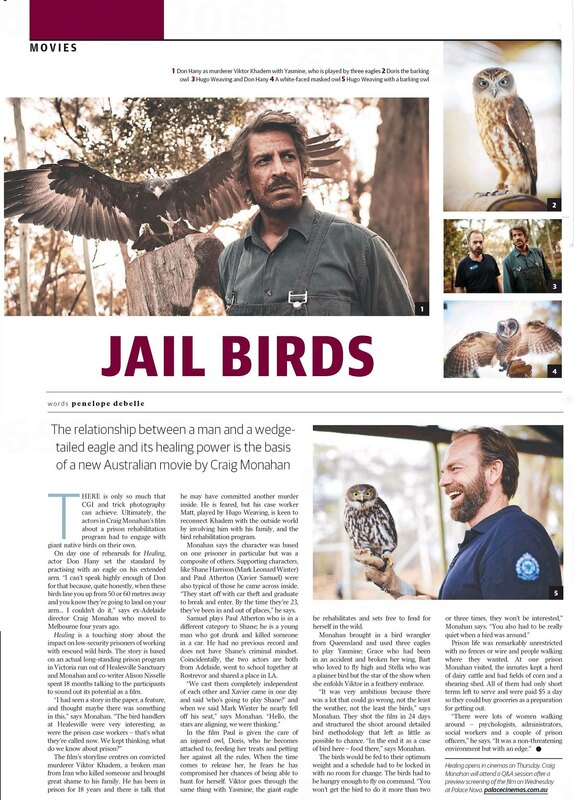 Monahan was inspired to make Healing after reading an article in The Age in 1998 about a program at Won Wron, a minimum- security facility near Yarram in Victoria, to see if prisoners could rehabilitate injured birds of prey to return to the wild. Authorities were sceptical at first because it went against what was deemed acceptable work for prisoners. However, it turned out to be a success and, while Won Wron closed in 1994, the raptor rehabilitation program continues elsewhere. Monahan and his long-time collaborator Alison Nisselle were instantly taken by the story of Won Wron. They were struck by the notion that taking responsibility for looking after a wild animal had the capacity to change someone’s life. “That always seemed very profound to us,” Monahan told The Age. 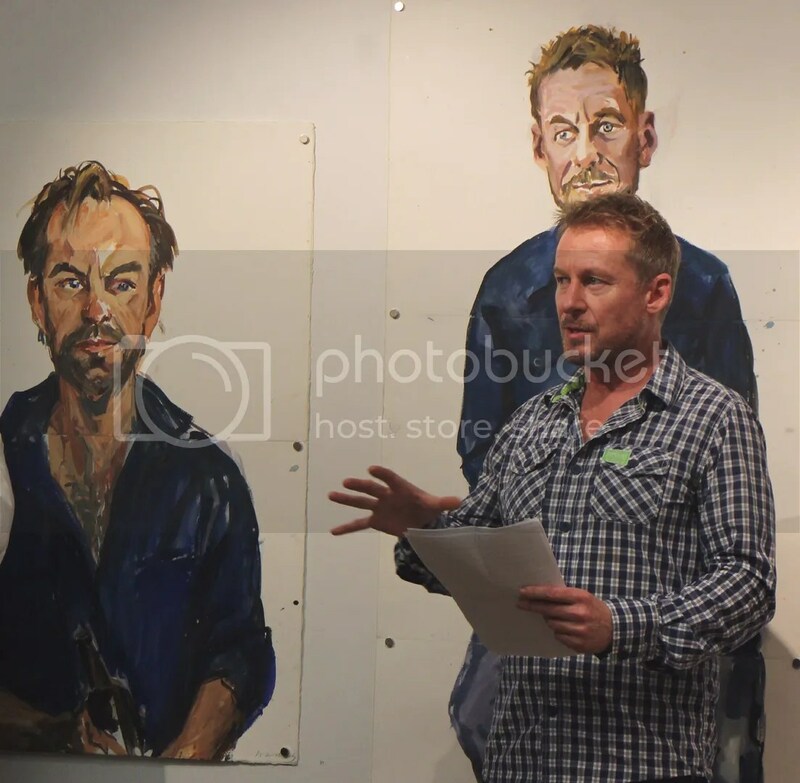 Weaving says that Monahan gave him the Healing screenplay while they were filming Peaches, so he has been involved not just in the evolution of the script, providing criticism and feedback, but familiarising himself with the bird program. 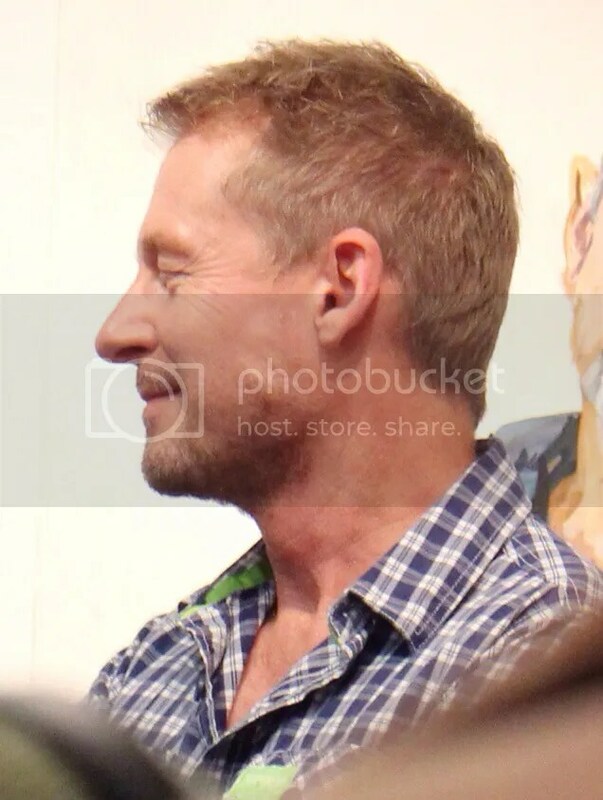 He is also one of the few actors of the golden generation that gave us Nicole Kidman, Cate Blanchett, Russell Crowe, Hugh Jackman, Heath Ledger and Geoffrey Rush who has consistently worked in Australia on screen and stage despite being an integral part of some of the biggest franchises in movie history and the most cherished cult movies. The unfalteringly gracious and articulate Weaving embraces his entire oeuvre – he even believes the maligned Cloud Atlas will be properly appreciated in years to come – and is happy to move between the mega-movies and the smaller home-grown projects. 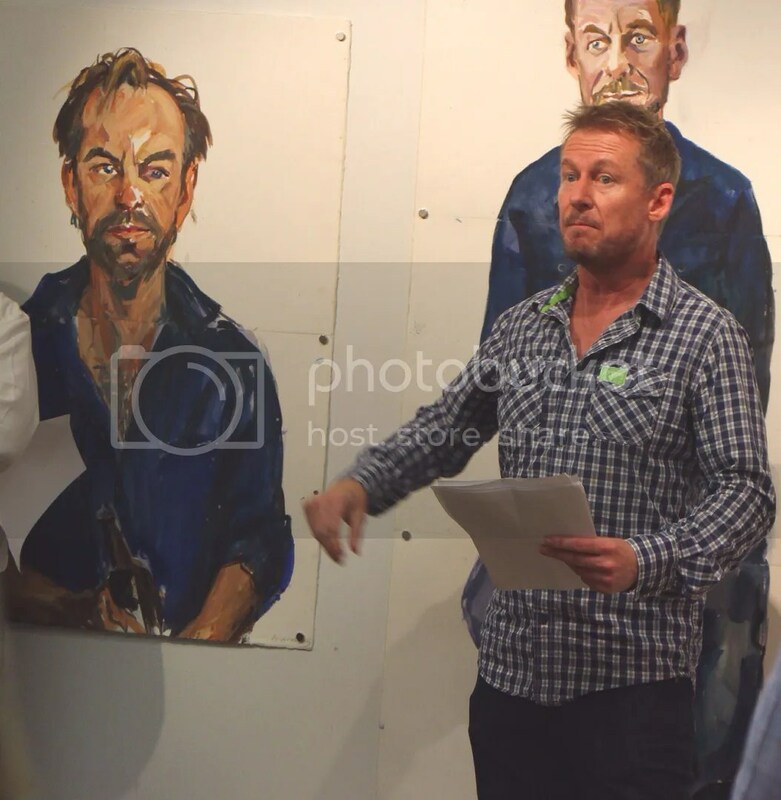 And he is excited by his role as Macbeth in an upcoming Sydney Theatre Company production. “Playing comic-book villains and ordinary Australians each has its pleasure and challenges. You do one and it makes you anxious to do the opposite,” he says. CJ here: This is a case where I’d really love to see the full transcript of what was specifically asked and what Hugo said in response, because some of his comments here are directly at odds with most other interviews he’s done over the past few years, which strongly implied he was done with “cartoon villain” roles and big-budget American films. I hope the last comment is an explanation of why he’s mostly done Australian indies of late rather than an indication he intends to take on the sort of insultingly one-dimensional roles Hollywood would give him. I do think he’s probably trying to reaffirm that he doesn’t regret any of his past choices, because a few interviews in 2012 were widely misconstrued by Marvel and Transformers fans as dissing of those projects, but in fact Hugo never meant any insult and only was trying to distance himself from playing the same character over and over. Obviously he’s not finished playing villains, as The Mule and even Macbeth demonstrate. (The Mule will probably be a very broad villain role.) And the character Hugo has been connected to in early reports about Glendyn Ivin’s possible next feature film, One Foot Wrong, would also be a nasty piece of work if the movie stays true to the book. So he’s very much maintaining variety in his career. I just don’t ever need to see him do another Marvel project, play a Star Wars villain or do evil robot voiceovers which distort his voice beyond all recognition. There are, of course, talented directors who do big-budget films too. I’d love to see Hugo work with Guillermo del Toro or any non-Tolkien work Peter Jackson might move on to. It could also easily be argued that American television offers more opportunities for fascinating, textured characters– good, bad and in between– than the increasingly adolescent-directed film industry. As far as the Wachowskis are concerned: I loved The Matrix and thought Agent Smith was a brilliant character, brilliantly performed. But Cloud Atlas gave Hugo no characters of meaningful depth to work with (though some were entertaining), and the Wachowskis’ unseemly eagerness to whore out their best characters in terrible, clueless commercials has alienated me from wanting to support their current projects. So I’m not dying to see Hugo work with them again, unless they give him something other than a stock villain to play. As its title suggests, Healing probes the process of dealing with loss, coping with regret, and moving on to a more positive future. Director Craig Monahan has said that making the film was part of his own healing process, following the death of both of his parents during the years that the film was in development. 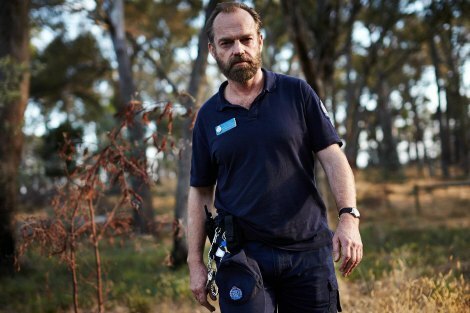 Hugo Weaving’s character in the film is inspired by a real-life minimum-security prison officer whose daughter had died. Such a program and process lies at the heart of Healing. ‘I’d read a number of drafts,’ says Weaving, who has shared a working relationship with Monahan ever since he starred in the director’s feature debut, the menacing police drama The Interview, back in 1998. 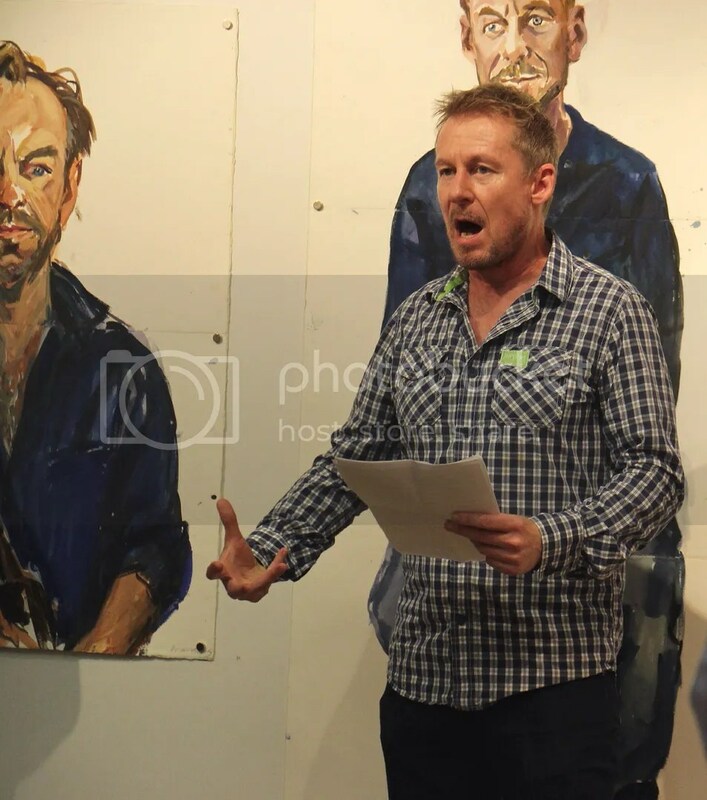 His character Matt, like his real-life counterpart, is a bereaved father, and his all-but silent grief lends considerable weight to Weaving’s gruff portrayal. ‘It is not demonstrated in any great depth, but you understand the magnitude of his grief and what he’s trying to deal with,’ says Weaving. Matt is inspired to initiate the program not just by his own grief, but also by his observation of the film’s hero, Viktor (Hany), an Iranian expat and inmate who bears his own deep emotional scars. Viktor is at the tail end of a prison sentence for murdering a friend. During the course of the film he must confront not only his sense of guilt over that deed, but also try to heal the family relationships that have been damaged by his errant ways. His care for the raptors mirrors and enhances this process of self-healing. 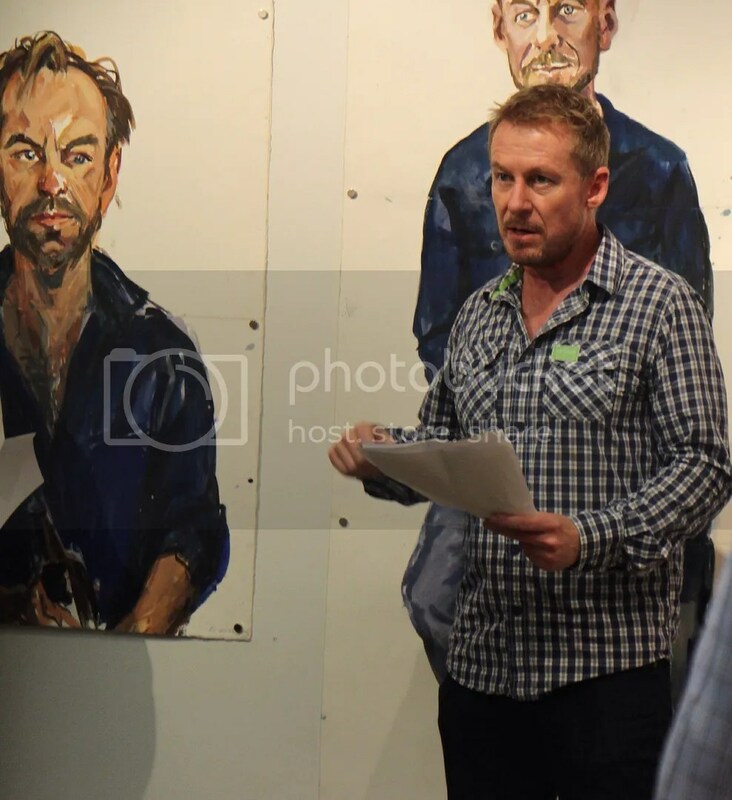 As part of his research, Weaving spent time at some of Victoria’s minimum-security prison farms, and hopes that the insights gleaned from these experiences will illuminate for audiences this often-unseen aspect of the justice system. ‘It’s a prison film and yet you’re in a facility that not many people know about,’ he says. ‘At these facilities there’s a great deal of trust and quite strong relationships between prison officers and inmates. Healing’s strongest attribute is its cinematography. Its images of birds in flight or repose stand as poignant metaphors for the ebb and flow of human dignity, the fragility and resilience of the human spirit, and the burgeoning self-respect. If the story is a bit thin at times, and the dialogue stilted, this is balanced by the gravity of the theme and by the performances of Hany and Weaving, as their characters push back with increasing resolve against the weight of grief and regret. In this regard it, like its characters, achieves transcendence. Don Hany, meanwhile, spoke to The Daily Telegraph/News.com.au . In addition to promoting Healing, he mentioned his past Australian series and possible jump to American TV (tentatively reinforcing what I said earlier, though the pilot’s chances and quality may vary widely based which network commissioned it. As far as US television stealth-casting so many Australians goes, the reason is simple: they are often better than American actors. ) 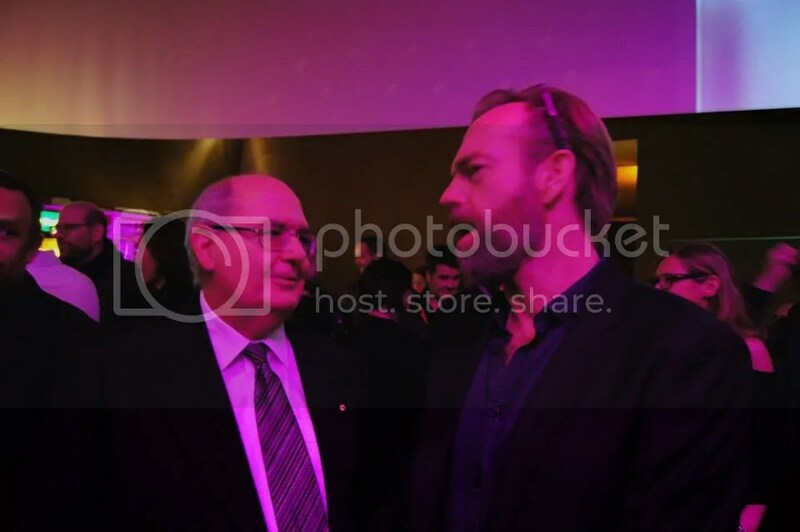 He also had very kind things to say about working with Hugo Weaving: “He introduced me to a philosophy about working that has changed what I will take to every job from now on… He’s such a fan of Australian cinema and a believer in making something that resonates. You couldn’t help but be energised by that.” And he mentions a close call with one of his feathered costars, “copping a talon” to the face when one of the eagles was accidentally startled. Hany also gave an audio interview to The Talk Hard Podcast, which may be streamed through WordPress or downloaded via iTunes, and there’s a new interview at The Sydney Morning Herald focusing mainly on the film’s raptors. Craig Monahan spoke to The Australian about the challenges of marketing the film: for the record, I disagree with the article’s contention that the marketing misrepresents or sentimentalizes the film. 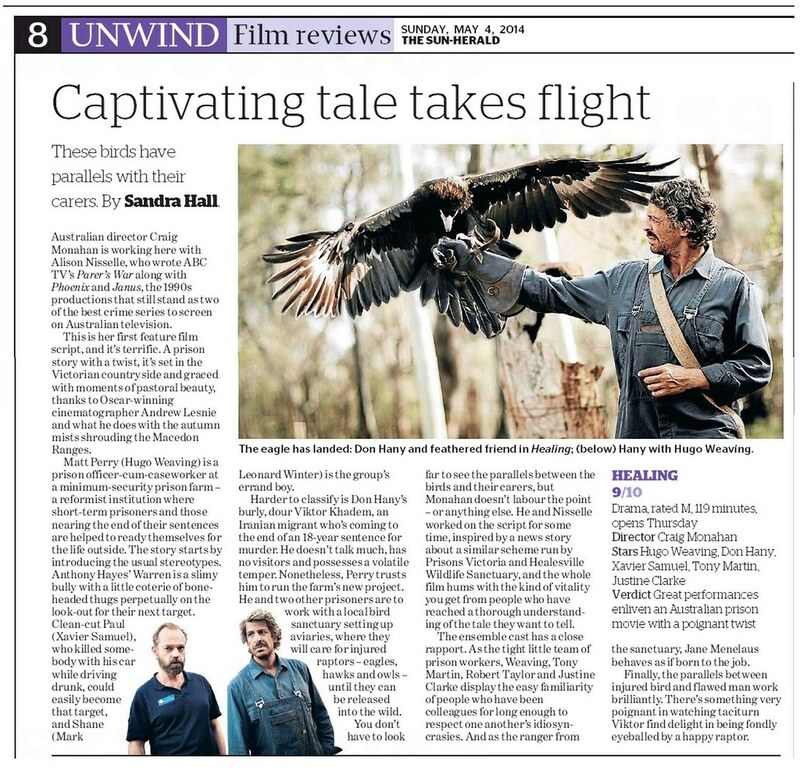 And an article in Star Community notes the Healesville Sanctuary’s role in the film. The reviews continue to be largely positive, with critics insisting the film never gets too sentimental for its own good outnumbering those who found aspects “corny” or wanted more of a grim storyline. Excerpts below, with links back to full reviews. The Reel Time podcast includes a very enthusiastic review of Healing starting at the 23.40 mark. Matt Toomey of ABC Brisbane give the film a solid B on the Breakfast With Spencer Howson program. 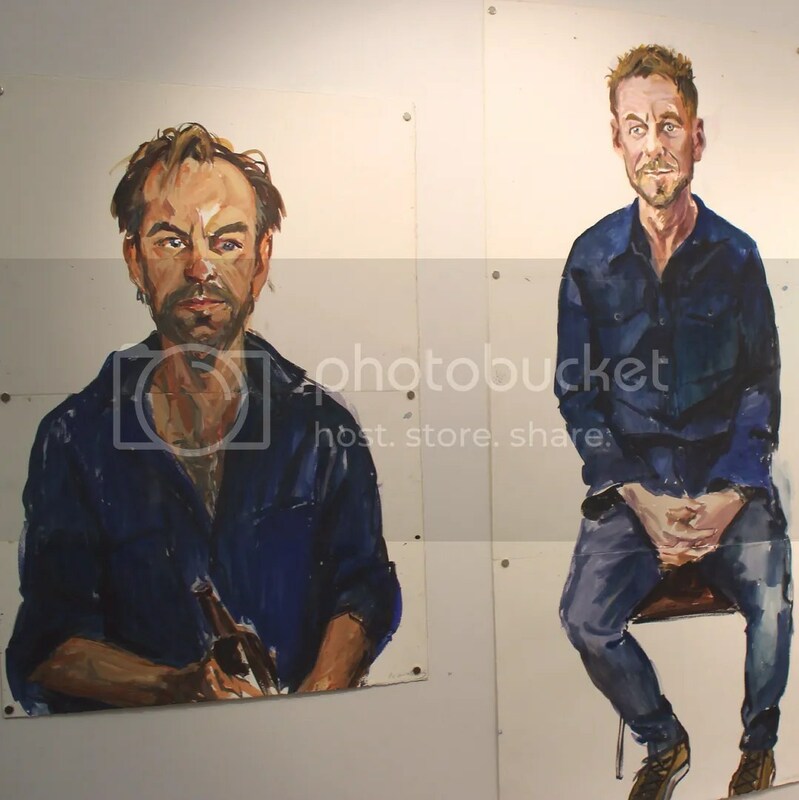 The 2013 Archibald Prizes exhibit, highlighted by Del Kathryn Barton’s Hugo Weaving portrait, will be shown in Nowra, NSW May 13-June 28 at the Shoalhaven City Arts Centre. more details available at ArtsRush and South Coast Register. Composer David Hirschfelder spoke to The Sydney Morning Herald about his scoring of the film. Don Hany contnues to appear at preview screenings and Q&As (sometimes with director Craig Monahan. He was interviewed on Network Ten’s The Project… but, alas, that clip, like most Network Ten content these days, seems to be blocked from international viewers. Reviews for the film continue to be largely positive, though a few cynics have chimed in with complaints about the film’s quiet, contemplative pacing and lack of shocking twists. While I’ve made criticisms like this about more than a few pretentious arthouse films (the oeuvre of Terrence Malick springs to mind), I get the sense that most of the complaints in this case derive from the film not being the sort of “prison film” they expected, or from critics who simply don’t find the subject matter interesting to begin with. (Me, I could watch birds of prey in my yard for hours…) Some also don’t find the redemption angle of the story credible, though Healing is loosely based on a true story and is set at a low-security facility for prisoners who are largely rehabilitated rather than among highly violent offenders. Still, I do want to share a cross-section of thoughtfully-written reviews whether I believe my response to the film will be similar or not. A lot of people I respect didn’t “get” Mystery Road or thought it was too slow. I find such opinions a bit daft, but would also find a 100% critical consensus on ANY film suspicious. No film is made for every audience. 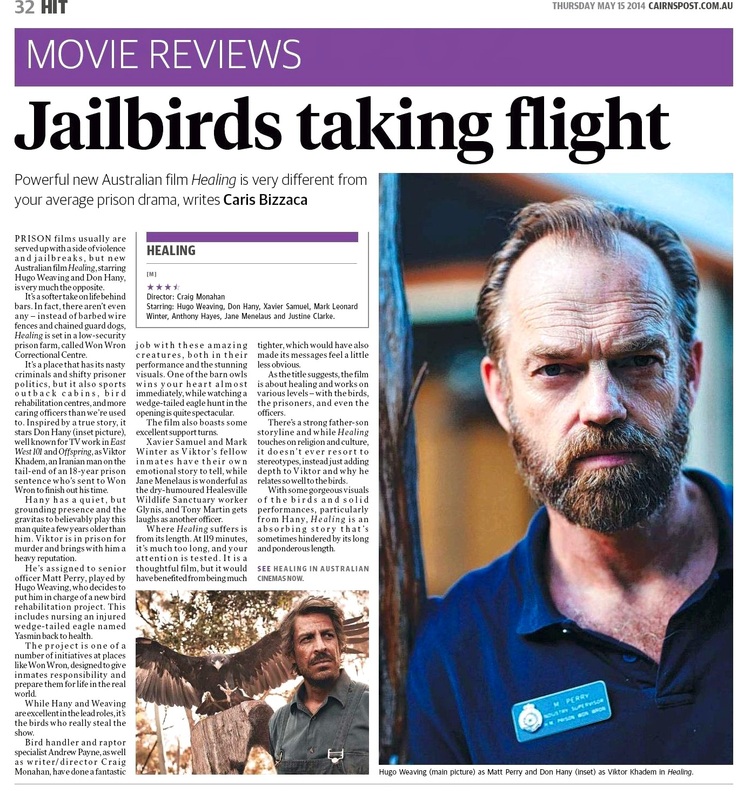 Director Craig Monahan continues his collaboration with Hugo Weaving, casting him as Matt Perry, the catalyst between prisoner and bird of prey… Weaving is reunited with Tony Martin his co star from Monahan’s feature debut, The Interview. 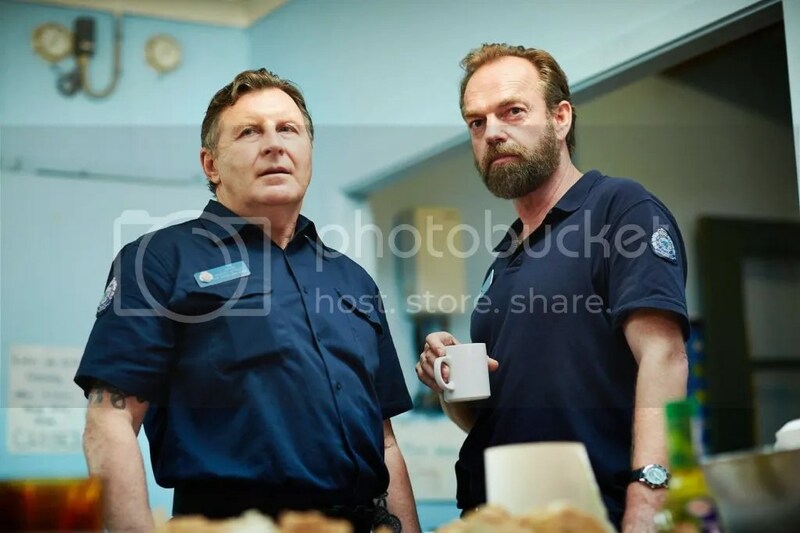 Here he plays a fellow prison officer, cynical and pessimistic about the power of the programme. Monahan has assembled a strong ensemble supporting cast to play the archetypal prison inmates…. A new report from Screen Daily confirms what earlier news reports from the film’s Broken Hill set (and some cast members’ sudden disappearance from Australia) suggested: that Strangerland has indeed wrapped production. The article shares the first official still from the film (below) featuring Nicole Kidman and Joseph Fiennes in the aftermath of the dust storm which got so much press attention during the shoot. Screen Daily also notes that Strangerland will launch its international sales campaign at the Cannes Film Festival, which begins later this month. Since Strangerland can’t possibly be completed, it’s probable that the distributor (Wild Bunch) is trying to sell the film to international markets based on the cast’s reputation, and possibly some raw footage, stills or the script. But it’s good to hear it’s already being marketed. Tim Winton’s The Turning STILL doesn’t have North American distribution, and has only screened at a few festivals outside Australia. This indicates that the dust storm happens near the beginning of the film, and thus is not a major plot spoiler. Finally, Chicago residents will have an opportunity to see Mystery Road on May 14 when it screens as part of the Chicago Critics Film Festival. Ain’t It Cool News provided more details and a nice plug for the event. Music Box Theater is the venue. US Hugo fans may remember that The Music Box Theater was one of the few cinemas to screen Last Ride during its brief 2012 theatrical run, and that the associated Music Box Films distributed it here.